When Chris Huhne resigned over an alleged driving incident, I had high hopes that Mr Windmill’s climate madness would be rapidly wound back, and the UK may be spared. Pity the poor Brits, then, as it is the Climate Change Act that has been spared, surviving a “green tape” cull to wreck the UK’s economy still further. Britain’s laws on climate change that push up energy bills for millions of households have been spared, despite George Osborne’s plea for a reduction in expensive green regulations. 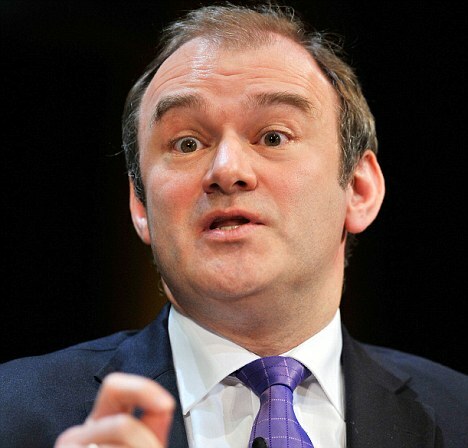 Ed Davey, the Liberal Democrat Energy Secretary, said he would not scrap or water down the Climate Change Act, after a year-long review into reducing bureaucracy surrounding environmental laws. The Act underpins all of the Government’s policies on reducing carbon dioxide emissions, from support for wind farms to higher road taxes for more polluting cars. It costs up to £18 billion per year, the equivalent of £650 for every household, according to a government analysis. Last year, all Whitehall departments were asked to look at scrapping laws in the Cabinet Office’s Red Tape Challenge, taking suggestions by the public into account. The Chancellor has said he is “worried about the combined impact of the green policies adopted not just in Britain, but also by the European Union”. He claims “endless social and environmental goals” mean “businesses will fail, jobs will be lost, and our country will be poorer”. Mr Davey said yesterday that the Climate Change Act is an “example of essential legislation” and all its supporting regulations must remain unchanged. His only concession is a consultation on reducing red tape for companies forced to pay for every ton of carbon dioxide they emit. The move disappointed campaigners against the Act, who have so far collected 1,000 signatures calling for it to be repealed. Roger Helmer sums it up perfectly. The UK is in debt to the tune of over £1 trillion and growing by the minute, so what’s a mere £18 billion per year – it just sounds like tuck-shop money!!! I sincerely hope that, some time in the future, all these politicians (UK, USA, Aus etc) are charged with treason and made to pay for the wanton destruction of their homelands. All their property forfeited to the people, and imprisonment for the rest of their lives. I was just listening to the ABC ‘By Design’ prog…they managed to get 15 references to ‘climate change’ within the first fourteen minutes of the program. Maybe a new government could cut the funding to the ABC…they’d certainly get my vote! My home Canada was a socialist paradise and if the Liberals or the NDP (both on the left) had their way they would have panicked to sign Canada onto to this Climate madness, but thank God we have the Conservative Government, they are saving our beautiful country from these types of lemming lunatics, at least till 2015. Good Luck to the Australia, UK, EU, and Obama madness land the USA. It does not surprise me that Ed Davey is as bad as his predecessor. Politicians are lazy. They don’t waste time researching for themselves. They prefer to be fed information. That way, whatever happens, they can then say, “Well, we acted on the advice of… “! I only know of one current politician who has genuinely made an effort to question the IPCC climate science and to examine the evidence put forward by skeptics as to why the IPCC is wrong and why Earth is not facing a catastrophic man-made global warming emergency. His name – US Senator James Inhofe. And he has come to the conclusion that the IPCC mantra on global warming alarmism is a hoax. That is why he fights so hard in the US Senate to stop all these green policies that would destroy the US economy. Good on him. Canada is at last seeing the light. Sadly, Australia looks to the EU as its role-model. I’d laugh if it weren’t so sad! yes but what did you expect? Socialism requires lunacy and deliberate squeezing to death of the middle class so only the politburo survive and everyone else is serfs. The so called “insane” laws arent insane – they are deliberatly designed to crush the middle class. The new dude might be clueless, but hes not setting the agenda – hes just a controllable puppet. Huhne is not awaiting trial over a motoring offence. Huhne is awaiting trial over Attempting to Pervert the Cause of Justice. I don’t believe that we should accept the Greenie spin which seeks to trivialise the offence. We can but hope, but expecting the green socialist liberal alliance of idiots to change or do anything useful is like waiting for the sun to turn blue.